Blog | MobileDraft | An overview of the Mobile landscape. Previous versions of your apps are now available for re‑download by users who have already purchased them, allowing customers to use your apps with older devices which may no longer be supported by the current version of your app. If you do not wish to make these versions available, you can manage the availability of your apps’ previous versions in the Rights and Pricing section of the Manage Your Apps module in iTunes Connect. Good move from Apple, especially with iOS 7 around the corner that will make many devs abandon updating their apps for iOS 5 and 6. Long-time iOS app AroundMe is a nice tool to look for stuff that is around you. It uses GPS to get your coordinates and then shows you nearby businesses and places in categorized lists. It’s quite useful and one of the earliest apps I still use. We completely redesigned AroundMe to be simpler and more enjoyable and fully compatible with the stunning new iOS 7 style. I’m using an iPhone 4S and I just got the new update saying its been redesigned, but the new redesign isn’t showing up. I even deleted the app and re-downloaded it and it still didn’t work. 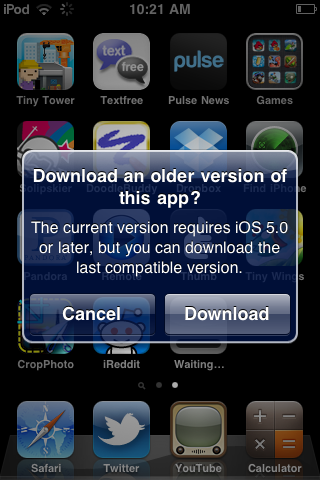 The 7.0 version of the app did NOT work on my iPhone 4. Still have the old design of the app. Ich kann den iOS7 Style nicht nachvollziehen. Heute geladen und nichts zu sehen vom iOS7 Style. Unter Version steht aber 7.0.0. Zeigt nicht das, was in der Vorschau zu sehen ist! Scheinbar sind dann auch die Bewertungen Fake. Stellt sich nur die Frage, warum hat der Entwickler das nötig? Schummelt hier einer mit der Programmversion? Vielleicht werden doch mehr Daten gesendet als angegeben? I can’t see the iOS7 style. I installed the update today, but the iOS7 style doesn’t show up anywhere. But version says 7.0.0. Doesn’t show, what it does in the preview! Seems that the reviews are also fake then. Now there’s the question why the developers need to do that? Do they fake the program version? Maybe they also send more data than it says after all? Attorno decided to only show the new interface to customers actually using iOS7 where it matches the style of the OS, but not on the old (or for some days left: current) version iOS6 with its very blue and gradient-heavy apps. As they didn’t differentiate and mention that in the update text, users are understandably unhappy. The really interesting question now is: Would users be happier if Attorno would have mentioned this in the update text? Or would reviews equally go down because of the missing new interface anyway (Note that the screenshots probably would only show the new interface). Fun times to be an iOS developer. Please note: the new style requires iOS 7. So now we can see if it makes a difference.